When it comes to pests, one of the primary causes of concern for most homeowners are termites. Although small, these insects can cause a huge amount of damage to your home in a relatively short amount of time. They literally eat away at the structural integrity if your home which can end up costing you thousands of dollars in repairs. However, with a proactive approach, you can learn to recognise the problem early and take action. Having an annual termite inspection conducted in your home is an absolute must for any homeowner looking to protect their property. A professional will be able to delve deeper into the makeup of your home and find any potential issues. However, between these professional assessments, you need to be on the lookout for certain telltale signs that indicate you might have a termite infestation. If you wait until your next inspection rolls around, there might already be a huge amount of damage done. Let’s take a look at some things that you should be on the lookout for so you can recognise if you have a termite infestation in your home and take action. One of the most important things to look out for when identifying for a termite infestation is termite cement. Termites produce a mud-like packing on top of wood as they chew on the timber. Be sure to pay special attention to the foundation walls of your house and at the joints. If you don’t catch it early enough, the foundations and joints can be completely destroyed and your house could come crumbling down. It’s also a good idea to check any cracks and holes around your house carefully to see if there is any dried dirt there. You may find it hard to believe that such small insects can make a noise that can be heard by humans, but they can. Unfortunately, when you hear a tapping noise coming from your walls, it means that there is a very good chance you have a large infestation of termites. Look out for termite droppings, which are usually found near where the termites are in your home. They can be found both inside and outside your house. Be on the lookout for tiny, oval-shaped capsules with rounded ends, normally only about a millimetre in length. Typically a termite dropping mound will resemble a pinch of salt or pepper. If your floors are beginning to sag, this could be a sign that termites are present. Unfortunately, a termite infestation can’t be detected early as they burrow into the wood way below the surface so it’s not until the wood is really weak will you realise that you have termites. To assess the level of damage, try tapping on your floors and walls. If you hear a hollow sound, it’s very likely that a lot of damage has already been done and you need to pursue an immediate course of action. 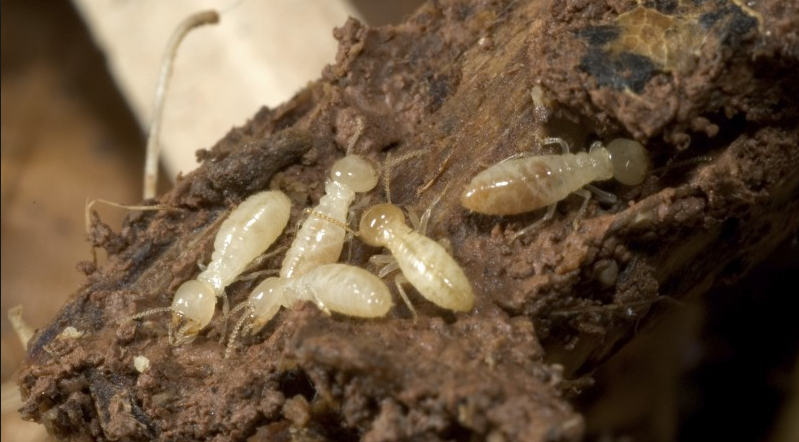 Subterranean termites make tunnels underground to a depth of 20 centimetres to transport food. Look for these around the foundations of your home, around water pipes, in the attic, and in the basement. These tunnels are a real giveaway that there are termites present. While it’s crucial that you have an annual termite inspection carried out in your home, it’s also important that you can recognise the common signs of a termite infestation yourself. It doesn’t take long for termites to cause irreversible damage, so be on the lookout for the telltale signs and take immediate action. If you’re in any doubt as to whether or not you have termites, it’s always best to call in a professional to double-check so that they can take the necessary steps to resolve the problem and get your home back to full health as quickly as possible.